Like every year, Samsung will launch the Galaxy S10 and S10+ with its flagship Exynos processor which, for 2019, is the 8nm Exynos 9820. Last month, the Samsung Galaxy S10 showed up on Geekebnch, and unlike the Apple A12 Bionic and the Snapdragon 855, the 9820 failed to cross the 10K mark for the multi-core score. But now, the latest Geekbench scores of the 9820 are out, and it looks like Samsung is catching up with the 7nm Apple A12 Bionic and the Snapdragon 855. As the image above shows, the Samsung SM-G975F (Galaxy S10+) scores around 4472 on single core which is not a big improvement from the previous single-core score which was around 4382. So, regarding the single core performance, the Apple A12 Bionic is still a beast. 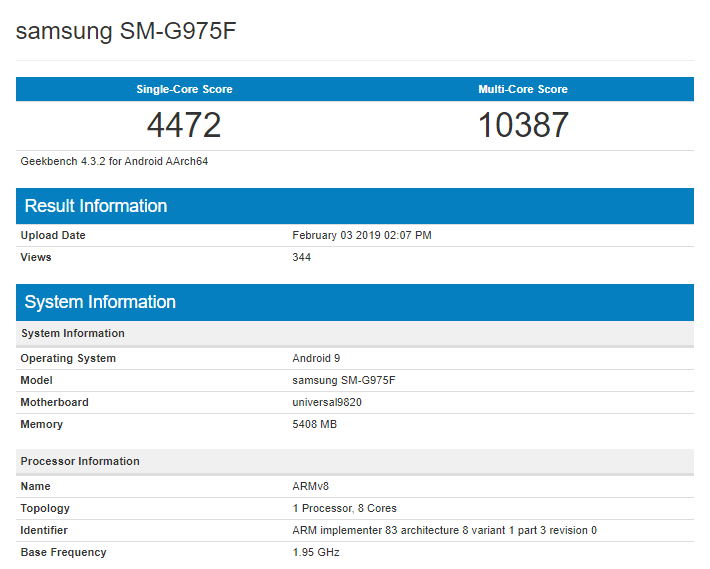 But, when it comes to the multi-core score, the latest benchmark shows that the Exynos 9820 scores around 10387 which is a huge improvement from the previous multi-core score that was around 9570. The Galaxy S10 and S10+ are launching on February 20 along with the Galaxy S10E and an expected foldable phone.